Since 1873, 18 km long railway led from Krnov to Glubczyce and steam engines operated here few times a day at the period of the first republic. During the war, the service was stopped. A short part of the railway on the Czech part was still used for some time as a connection to local brick company, but at present time the connection is completely canceled and all the rails were removed. A longer part of the railway on Polish side was used till 1980´s for passenger transport. Later, the railway was just being kept up – reportedly because of the needs of Soviet occupying army. After the fall of communist regime, the railway lost its importance. The service was completely canceled and all the rails were removed. The last railway milestone was April 2000, when the last train left the station on the last operating railway between Glubczyce and Raclawice. Since that time no train has gone through the station. Polish national railways tried to save the station and at least sell it for some other purpose. 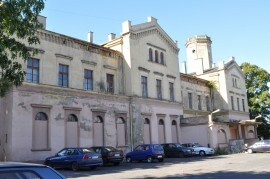 The original price was circa CZK 3 million for a beautiful building with its surrounding lands. Unfortunatelly no candidates occurred and the price went down continuously. 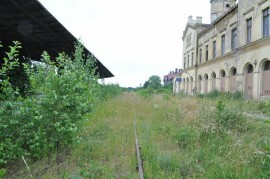 Finally, the national railways sold the station building to Glubczyce town for a symbolic PLN 1. At present time, the station is in a state of disrepair and the town council still looks for its purposeful use. The station in Glubczyce is a faithful copy of a station in Thessaloniki, which does not exist any more, because it burnt down. When the American film makers wanted to make an expensive epic „Triumph of the Spirit“ (Czech name „Vítězství ducha“), whose plot was set in Greek, they had to make the film here in Glubczyce. Famous Hollywood stars such as Willem Dafoe performed here at the station. . This film made Glubczyce station very famous. At present time, the railway station building is closed, but railways and platforms are freely accessible. Web Silesia without borders » Tours with QR codes » Tour "Famous villas"